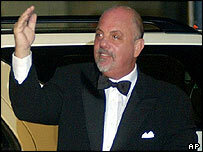 Singer Billy Joel has checked into a rehabilitation centre for alcohol abuse, his spokesperson has confirmed. The US star's treatment follows a 10-day stay in a substance abuse and psychiatric hospital in 2002. A statement from the 55-year-old singer's spokesperson put his latest problems down to "a recent bout of severe gastro-intestinal distress". In October, he wed 23-year-old Kate Lee. Earlier that year, he was involved in his third car accident in two years. The statement said: "Following a recent bout of severe gastro-intestinal distress, Billy Joel has checked himself into an undisclosed rehabilitation facility for treatment of alcohol abuse. "Mr Joel has asked that his privacy be respected." The singer, who found fame in the 1970s, was behind hits including Uptown Girl, Tell Her About It, We Didn't Start The Fire and The River of Dreams. But in 1997, he announced he would not write any more pop songs in the foreseeable future, concentrating instead on classical scores.